Lieutenant Alec Williamson and Sergeant Edward Hoare (Royal Air Force) achieve their first two victories as a team when they shoot down two Halberstadt’s at Houlthulst Forrest. Signaler Ernest Godfrey Dicks (Royal Naval Volunteer Reserve) are killed when their ship is sunk 130 miles northwest from Cape Villano. His brother was killed last month. Signalman Samuel Watmore (Royal Naval Volunteer Reserve) lost at age 19. His father was killed in action last April. Major Henry Wilfred Persse MC (Royal Fusiliers) dies of wounds at age 32. He played in 51 matches for Hampshire County including the 1905 County Championship. His brother will be killed in October. Lieutenant Maurice Richard Wheatley Johnson (Indian Army Reserve of Officers attached Kohat Mountain Battery Indian Mountain Artillery) is killed in Mesopotamia at age 28. He is the son of Brigadier General R F Johnson CB CMG CBE. Lieutenant Harold Francis Amboor Keating (Royal Engineers) is killed in action at age 23. He had won the Gold Medal of the Royal Asiatic Society while at Eton. Second Lieutenant Douglas Gordon Fisher-Brown (Royal Garrison Artillery) dies at home. His brother was killed in action in August 1915. Sergeant Alexander McClintock DCM (Montreal Regiment) commits suicide after having been severely wounded in November 1916. 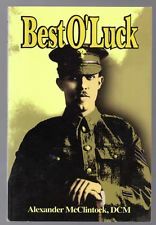 He is the author of Best O’Luck. Lance Corporal Eri Wonnacott (Gloucestershire Regiment) is killed at age 22. His brother was killed in May 1917.